James Buchanan was the 15th President of the United States who served in office from March 4, 1857 to March 4, 1861. What was the life of James Buchanan like? The short biography of President James Buchanan covers important information and facts about his early life, his family, career and the famous events and achievements of his political life. Our short biography of James Buchanan provides an interesting and easy way to learn about the life of the President. The following important facts provide a fast overview of important facts about President James Buchanan. Facts and Info: James Buchanan was the 15th president of America and the only bachelor to ever serve in the White House. An ineffective president, he failed to find a compromise to keep the South from seceding and the Union broke apart. For additional info refer to 20 Facts about James Buchanan. Facts and Info: James Buchanan was born in a log cabin on April 23, 1791 in Cove Gap near Mercersburg, Pennsylvania. He was the son of Irish immigrants. He died on June 1, 1868 in Lancaster, Pennsylvania. Facts and Info: The career of James Buchanan included the roles of Lawyer, Soldier, Politician and Statesman. He received a good education and graduated from Dickinson College. He became the 15th President of America in 1857 and served for 4 years until 1861. Facts and Info: James Buchanan was never married. His fiancée, Anne Caroline Coleman, broke off their engagement and died a week later. Buchanan was the only bachelor to be president and his niece, Harriet Lane, fulfilled the role of hostess at the White House. Facts and Info: James Buchanan belonged to the Democrat Political Party. He was 65 years old when he was inaugurated as the 15th president. Inauguration is a President's swearing-in ceremony. John C Breckenridge stood as the Vice President. James Buchanan was the last pre-Civil War president. For additional facts refer to his Presidential Cabinet members. Short Biography of James Buchanan: What he was like! Facts and Info: James Buchanan was an imposing figure with broad shoulders and stood at 6 feet in height. He had grey hair and a fair complexion. He had an unusual eye disorder where one eye was nearsighted and the other eye was farsighted. To try to compensate he developed the habit of cocking his head to one side and closing one eye. James Buchanan supported Abraham Lincoln throughout the Civil War and served in the War of 1812 in a band of volunteers who marched to the defence of Baltimore against the British. His nicknames were “Old Buck” and Ten-Cent Jimmie due to his claim that ten cents a day was enough for a working man to live on. Facts and Info: During his lifetime he played a key role in important events of the era. During his presidency John Brown seized the town of Harpers Ferry in Virginia in a futile attempt to spark an uprising of slaves. He was captured by Robert E Lee and hung in 1859. The Southern States begin Secession in 1860 & the Confederate States were created in 1861. On a less somber note, the Pony Express was established in 1860. 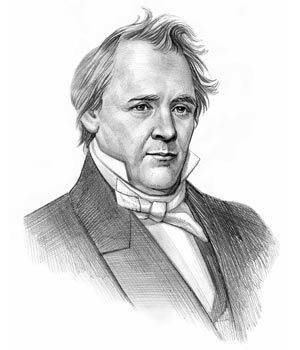 Facts and Info: James Buchanan died of respiratory failure on June 1, 1868 in Lancaster, Pennsylvania. His funeral procession consisted of over 20,000 people. He is buried at Woodward Hill Cemetery. The short biography of James Buchanan provides a fast overview of the key facts and events about his life and the accomplishments of his presidential term in office. The following James Buchanan video enables you to sit back and listen to the history of his personal and political life - a useful educational resource for kids, children and schools learning about the life of President James Buchanan.